Rescue Frenzy is rated 4.0 out of 5 by 30. 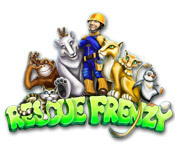 Rated 5 out of 5 by Freya06 from Love this Rescue Frenzy This is such a delightful game; the tools the team uses are amazing and so much fun to watch as they clear obstacles. Each episode has many chores to complete and it's definitely worth the money. They even carry the enjoyment to the exit level where it's fun to watch the 'yes' button. I highly recommend this game and can hardly wait for the next edition. Rated 5 out of 5 by godfreygirl from I love this game....it's SO addicting! What a cute and refreshing game to play. It's very addicting. Once you get the hang of it, you want to play again and again. I love the little guys running around doing their jobs. They use little Jeeps, picks, hoses, bulldozers and other heavy equipment I don't know the name of. I also love the fact that when you click on an item needed.....like food, money, building materials, etc, you don't have to wait for them to run back to base like many other TM games. The second they pick it up, you can click on where you need it. You fix roads, clean up oil spills, rescue people and animals, put out fires, repair buildings and all sorts of things to clean up the environment .......it's just VERY fun to play. I also like that the workers run pretty fast.....in some TM games I have, they run SO slow and you have to wait for a power up to make them run faster. It's just a fun little game all around....very fun. The graphics are great, the music is great, the story line is great......the whole game is great. I highly recommend it!!!! Rated 5 out of 5 by madme1 from Fun game. I've had this game for some time - basically since it came out! And I still love playing it. Some levels are harder than others, but I find this more fun than the rescue team games for some reason. The graphics are a little dated now, obviously, but it's still fun and it's easy to see what everything's meant to be. It does get frustrating sometimes as the little characters are driving round in trucks and then get out an run to pick up food etc. When will there be a sequel? Only been waiting 4 years or so :( I guess i'll have to keep uninstalling it for a while and then re installing it and try to keep beating my score. 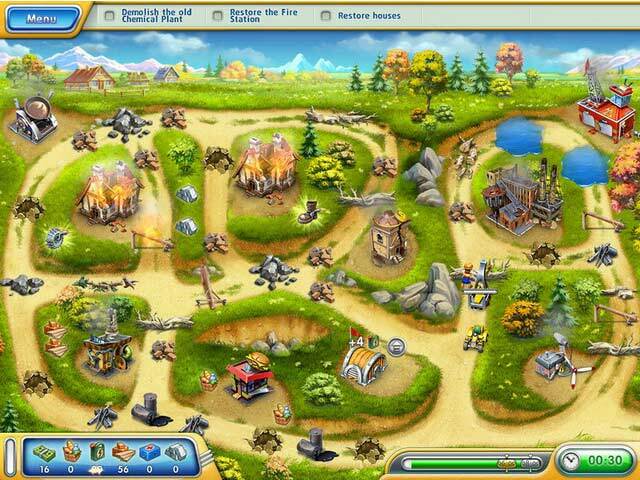 Rated 5 out of 5 by plat1098 from Rescue ME I'm addicted to the repair and rescue from devastation concept. This game gets reinstalled more often than the majority of other games in my collection. Can't explain why I like it so much, just that it's major fun. Would be appreciative of a sequel, you know? Rated 5 out of 5 by Mel2015 from Rescue Frenzy junkie Please make this game rescue frenzy compatible to the iPad Thank you. Rated 5 out of 5 by playerRoxie from Loved it :) I like this TM game, it's cute and fun to play. I like the whole "rescue" theme and storyline, and that there are so many things to do. Along with the usual road clearing/building/collecting resources of these kinds of games, there are also fires to put out, pump stations to dredge hidden areas, people & animals to rescue. Yes it get's a bit repetitive sometimes while you're trying different approaches to get gold, but it's challenging without too much frustration or more than 1 or 2 repeat attempts. Which is the perfect pace for a wind down - the gameplay is relatively straightforward, not too easy, not that hard. If I was sitting down for a brain-melting marathon it would be a bit too simplistic and repetitive, but playing just a handful of levels at a time - it's good fun. While I initially found the graphics underwhelming, once I started playing I really warmed to them. I don't play with the sound on so can't comment on the soundtrack. There are no bonus levels or extras, and just the one game mode, a bonus level would have be nice. The only other things I found annoying were (a) when you hover over buildings, the popups impede your view of resources etc. and (b) when I exit the game, the "Yes" (to exit) button keeps moving around as I'm trying to click on it, the cute cub in the picture doesn't want you to go, which is very nice except I'd click and miss it the first 1, sometimes 2,3 times as it ran away from my cursor! 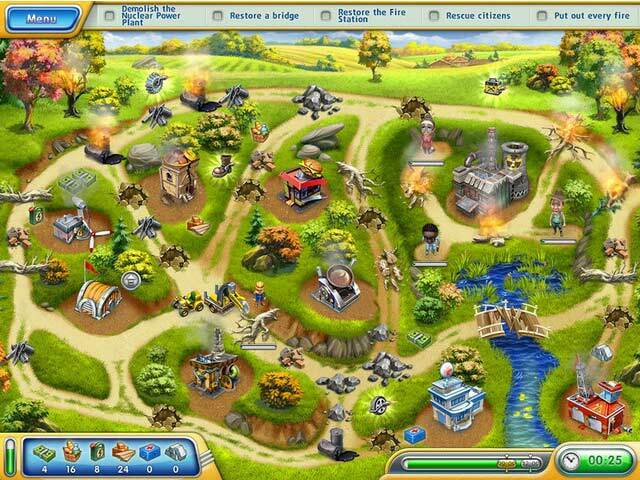 If you like the build-a-town type TM/strategy games, you'll like this one. 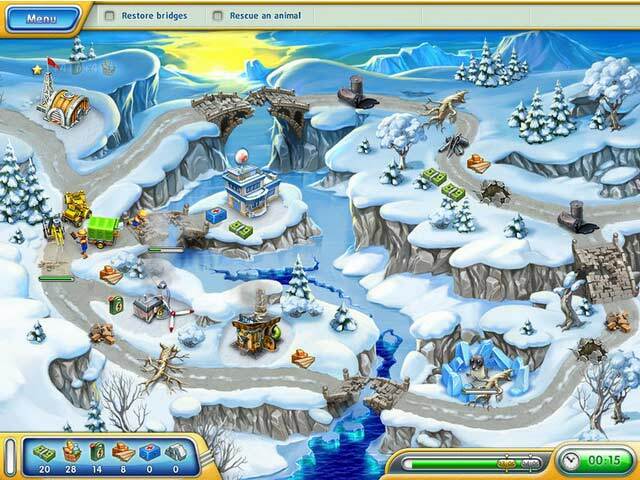 Rated 5 out of 5 by sundene from A real quality Time Management game There are so many things to recommend this game. The graphics detail on the small machinery is excellent, and just watching the little engineering feats of the rescue workers and their equipment is amusing in itself. The game really required me to think and retry to get the gold. I played the entire game through once, gaining mostly silvers, and went back for the challenge of getting the gold. Having said that, it IS doable! The game mechanics are subtle and somewhat sophisticated, so I was never ever bored. If you like MKFTP or Viking Brothers, for example, you will probably love this game. To my way of thinking, it's even better than the Rescue Team series, which I also enjoyed. I highly recommend this to anyone who is seriously addicted to TM games. Rated 5 out of 5 by Ziggy_Zigster from This Frenzy game is no disaster. I'm not very fussy on game genre, I'm more fussy about game playability and fun factor. That being said - with time management/strategy games it's usually hit-or-miss IMO. This game is a hit. The game is stable and playable. The graphics are pretty neat (though not 'high-graphic') and there is a storyline that goes along with it. What my major gripe with this genre of game is the playability factor - Is it stable? Is it challenging, Is it winnable? This game is all three of those. The added element of being able to go back and replay a level if you don't achieve the 'gold trophy' time achievement makes all the difference. You can get used to a level, try different methods to see which route produces the best result. Some TM games are either too easy to play or too hard/frustrating to enjoy. This game is neither of those IMO. Give the trial version a try if you wish, but if TM games are your thing - this game will please you. Rated 5 out of 5 by JeanneQ1223 from Rescue Frenzy I really enjoyed this game. It's not your typical time mgmt. game. The only thing I would change is the music, really annoying but that is what the mute button is for. Rated 5 out of 5 by Xfactor_101 from Great Fun I really enjoyed this game.. Each level was more challenging however, not so difficult that it takes away the fun. The only downside is that each episode has to load..